State Fair – Travel. Garden. Eat. 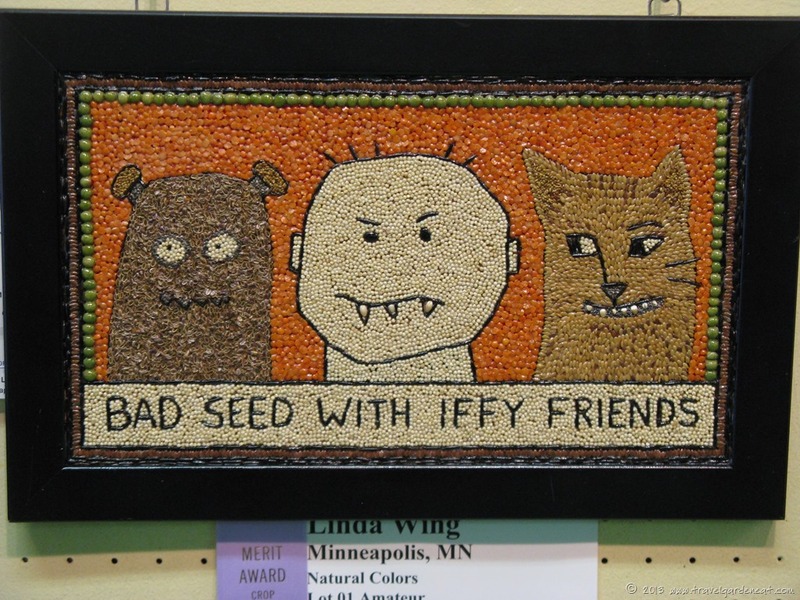 The crop art is always unique at the Minnesota State Fair. A stop at the Agriculture-Horticulture “Ag-Hort” Building is a “must” for our annual trip to the Minnesota State Fair. Displays of competitive entries range from Christmas trees, to honey and bee-related items, to flowers, to fruits and vegetables. Crop art tops the list of my favorite competitions (with the scarecrows a close second). A. Seeds, stems, heads or panicles, and fruiting bodies or structures of oats, wheat, barley, flax, rye, corn, soybeans, edible field beans, sunflowers, common buckwheat, field peas, millets, safflower, sorghum, sugar beet, sudan grass, common forage grasses (timothy, bluegrass, bromegrass and wild grasses, etc. ), clovers, alfalfa, and wild rice. Crop plants shall be those specimens grown in Minnesota, white rice and sesame seeds can not be used. Superintendent shall be the final authority regarding crops grown in Minnesota. B. Seeds and dried fruiting structures only of any horticultural crop (vegetable and flower plants) which is suited or adapted for Minnesota are allowed in all lots. Forest, trees or shrub plant parts are allowed in lots 9-16 only. Weed seeds or plants are not permitted in any lot. C. Seeds can be in various forms such as whole. ground, rolled or cracked. If the seed display is either ground, cracked or rolled it can not exceed 20% of the area of the artist work. D. Permission to use materials other than the above must be obtained from the Superintendent. E. The use of plant parts or seeds other than those enumerated or specifically approved by the Superintendent will disqualify the exhibit. F. Backgrounds: Suitable backgrounds may be plywood, canvas board, heavy mat board, paneling, burlap (colored), linen, and suitable other fabric. Such backgrounds may not be painted in lots 1 and 2. Masonite/hardboard cannot be used as a backing. G. Framing; see specific lot. When required to be framed, exhibit must be so framed. Suitable edging of seeds permitted in lieu of metal, wooden, or synthetic frames. Selection of frames should be such as to blend with the work involved. H. In lots 3, 4, 7 and 8, as indicated, 70% of the exposed area must be covered with seeds or plant parts. In lots 1 and 2, the background should be covered using seed. The “wearable crop art” competition includes some particularly peculiar and unique pieces of apparel! This post was in response to the Daily Post’s Weekly Photo Challenge. ”Unique” was this week’s theme. Everyone is welcome to join in the Challenge; further details on how to participate and links to others’ responses are found here.